If a knife with a little pizazz is what you are looking for, the Buck 119BR special fixed blade is exactly the hunting knife for you. With a beautiful Cocobolo handle, this knife stands out from the others that only have plain black or silver handles. The gold rim around the bottom of the handle also makes this knife a gleaming beauty, which stands out in contrast of most hunting blades and knives. If you are looking for a knife that is capable but does not skimp on style, try the fixed blade knife. With the 4-ever lifetime guarantee you will surely be able to keep this snazzy knife at your side for as many seasons as you can possibly hunt. This blade will last as long as your passion for hunting. Not just for hunting, this knife is also for working. Can be called a triple duty knife as it allows for regular working, hunting, and piercing alike. 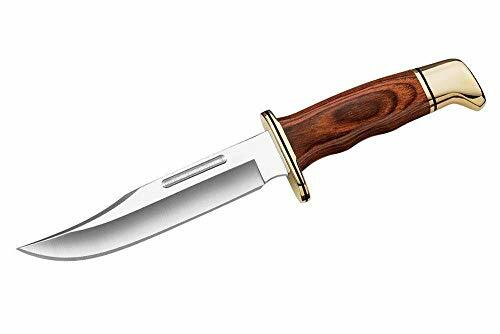 This type of knife will allow you the chance to work on anything from whittling as well as other things that you may need around your camp site. From cutting foraged items to cutting up pieces of a hunt, the Buck 119BR special fixed blade will fix up everything that you need. If you want a great gift for a hunter, or someone who needs their equipment stocked for their first hunt, this knife will do, as it can perform a multitude of tasks. The Buck 119BR knife has the ability to keep its edges sharp and concise. The 420HC stainless steel blade of the knife is built to last a lifetime. With proper care and storage, the edges of this knife will last or much longer than many other knives. Buck knives act as the best deer hunting knives as the edges do not become dull after hunting and preparing game. In the off season, keep this knife stored correctly and the edges will be just as new when you remove the knife from its hiding spot and prepare for your next hunting trip. The Buck 119BR knife is one of many, in a long line of buck knives that live a very long life. This knife, with its curved blade and fine tip, will only need to be sharpened when necessary. Sharpen this knife at the beginning of the season and you will find that it will last you until the end, depending on how much you tend to hunt. Though this buck knife sharpens easily, be sure to sharpen it properly so that your blade does not become damaged, or that you will not have to sharpen the blade more times than necessary. The tip of the Buck 119BR knife has a curved blade and a pointed tip that lends itself to helping with piercing items. No matter if you need to make a small incision or a large curved hole, this knife can get the job done. The tip is just as durable as the blade, which makes it easy to take care of. The sheath needs to be used in order to keep the tip protected when it is not in use for cutting necessary items. More eye catching than most other buck knives, the Buck 119BR special fixed blade knife has the option to give you something that you will be proud to show off, even in your pocket. The base of the knife has a brown and black Cocobolo base. There is also gold around the base of the handle which makes this one easy to pick out of a line up if you are going hunting with friends. The finger guard helps to keep your finger safe without having to deal with any accidental cuts or slips of the hand. Much like other buck knives, the learning curve is small. Handing the curved blade takes a little precision, but is easy to get used to after a few times that you have used it. Make sure that you always use the sheath with the knife in order to hold it in your pocket or on your hunter’s belt. Even a true novice can learn to use the Buck 119BR special fixed blade knife after just a little bit of work. Making this knife work can make it happen very easily. Much like other buck knives, the learning curve is small. Handing the curved blade takes a little precision, but is easy to get used to after a few times that you have used it.